Clash of Clans is a mobile app game for popular platforms like Android and iOS, although they are still backed by servers keeping everything running when playing in multiplayer against other gamers. 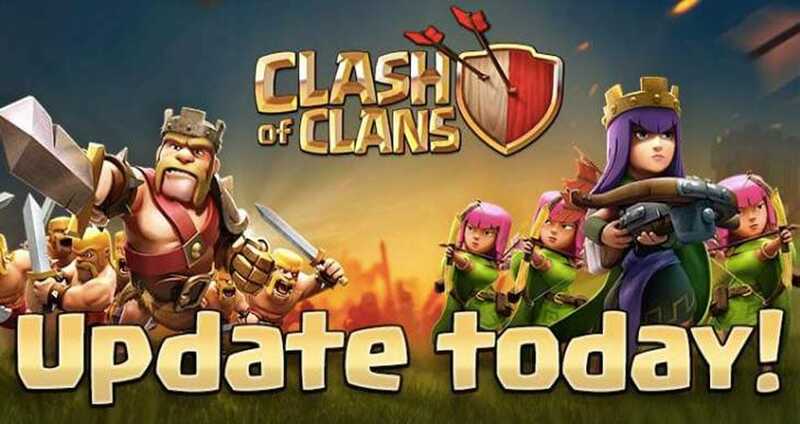 Clash of Clans will go down occasionally, especially when updates are being performed or the servers hit unexpected demand thanks to higher than normal traffic. The majority of Clash of Clans problems when something is not working focus on connection errors, the sign in, the app not working or opening, sharing on social networks like Facebook, app crashing / not loading, and of course bugs within the game itself. If you are wondering if Clash of Clans is down today, or if others have similar issues with the game, you just need to look at status reports below and share your own issues to gain help from the community. We’ve included support contacts for the game on this page as well and recent support tweets. If you are having problems leading your army to victory thanks to the online service not working, then we’d like to hear about it. If Clash of Clans is down today, then reports will be found below. OK so the Clash of Clans had a maintenance break earlier today, they say it was to do with server upkeep and a Tornado Trap duration change, but what I was waiting for was a season GOLD pass because I want the queen skin. Today maintenance break lasted for around 25 minutes and I am not going to CLASH ON like they put it because I am floating in the clouds somewhere not being able to open my game. Why we are on the CoC subject, please please make the gold pass available via gems. Im having the problem of coc stopped working every time i open the game. This is happening When i update the game to new version April 2019. I have tried everything restarting,clear data and chache,uninstalling and reinstalling but nothing is working plz reply with good suggestion…. I am having problems playing multiplayer since the maintenance break that happened today. I thought there would be some amazing fix for multiplayer issues but yet its for upkeep of the servers. ISSUE AFTER NEW UPDATE IN JANUARY, 2019 – COC is giving me problems now with both my tablet and APP. “DOWNLOADING CONTENT” is freezing and the APP won’t open. I have a brand new LG and a Samsung Galaxy Tab A….every other App works fine. WTF Supercell – A bunch of a-holes!!!! The same thing has been happening to me all day. Have u found a solution? I basically can’t install the update on my phone. I download it just fine but once it’s complete it says installing for a second then jumps back to the Google store clash page with the option to update still there. I tried uninstalling it but now I can’t even download it … same scenario as above. I tried clearing the Google Store’s data and restart with no success. Im currently in a clan war, with not much time left and now this? Really? Coc crashes on both android and apple devices when playing clan games. As soon as you tap clan games, the program collapses. Cannot open on two iPhone 6sâ€™s, one 7, and an iPad! Very annoying! Just get a black screen that never loads. from 3 days it is showing login failed .my internet speed is very good . Guys here is a solution for this. 1) first go to settings-app manager-coc. Clear cache and data and uninstall from there only. 2) Get the app from your friends in which coc is running well through xender or SHAREit. I have this weird feeling. I am going to have to change service providers. No same here, I am being blocked from the website. I believe it might be clashs servers, or provider problem because most people are having problem with lg product including me. Still no answers though, I have been searching the net for anything to help me, most of it is false advertising. Goodluck, I am super frustrated, was in war and now Im probably not even in clan. It’s annoying do i just have to wait for it to fix it’s self? Mine does the same thing! Don’t want to delete it and lose everything….not sure what to do. I’m from “The Netherlands” and since the beginning of “may 2018” there was a new/updated privacy law in The Netherlands. Because of this, everyone in The Netherlands had to re-accept all privacies on everything. (Including subscriptions, facebook, email etc. You get the point) Maybe after the “Big Th12 Update”, the new privacy law started causing trouble for everyone?! This is just what I think, I don’t know how to solve this. I’m from “The Netherlands” and since the beginning of “may 2018” there was a new/updated privacy law. Maybe after the “Big Th12 Update”, the new privacy law started causing trouble for everyone?! This is just what I think, I don’t know how to solve this. from yesterday and after updating the game i can’t access to the game and even updated to ver. 10.322.7 but no change. i am sure that the internet connetion has not any issue. Mine still isn’t working on my LG ANDROID phone.. works on my brother’s Samsung tablet and phone…. It says network error everytime I open it and then glitches out my phone so the WiFi doesn’t work on anything…. I had to delete the game and restart my phone… Any updates for when this is going to be fixed? Mine wasn’t working. Not sure if something has been fixed, but I turned off WiFi and tried running clash a couple of times, then turned WiFi back on and tried again. Joy. i am getting the error ‘unfortunately clash of clans has stopped working’ after i updated to the latest th12 update. So please fix that issue. Ohhhhhh!!!!! Come on, supercell look into the matter you got all these people complaining doing uninstalling and reinstalling just to get war attacks in….you making a bad rep for yourself….peace out. Done update,can’t open my coc account. Mine says it keeps stopping I redownloaded I cleared cashe re started my phone still doesn’t work wtf!!!!! I’m having the same issue. I tried everything in the book and nothing has worked. just a black screen. Whats going on here? C’mon Supercell.. How are you going to mess up an update so bad it literally makes my phone go stupid. PS. If you have the problem with loading CoC and then going to the internet to see your internet doesn’t even work. I can just disconnect and reconnect Wifi and it comes back up. Only when I try loading in the game does it do that though. Same here after update its “connection error” anyone got any ideas??!! Have tried to login with multiple devices and I’m still getting the same thing,…the black screen. Boom Beach is working fine, but not Clash of Clans. Hey Guys, Seriously…If and only IF you have a Google account where you logged into Clash of Clans, will this work…I just fixed mine. Check your play store and see if it is in there. How I got into the game is: 1) Delete Clash of Clans. 2) Reload Clash of Clans in the Google Play store. 3) open app, it will start but stop. 4) shut phone completely off. 5)Turn it back on after 15 seconds AND open up Clash of Clan. You will not lose your play history. I am not sure 100% why it does not work for everyone, but I would guess it has to do with the Google play center, not having their account saved. Good Luck, it worked for me…Honestly. After the update all i get is a message saying ‘clash of clans has stopped’ on my samsung phone. No problem on my iphone. Anyone know how to solve this? I have done the same thing. I tried to contact supercell about it but nothing in return. I am on a LG premiere and the new update keeps not opening saying no network connection. I am pissed about this. After CoC auto updated..it will crash upon opening the app. I’m working with a Samsung S7 edge. The app will open to the black screen then shortly crash. Please get a quick fix to this!! Urghh!! Tried it and it didn’t work for me. Done, uninstal and reinstal as well as hard reboots but currently no success. Hopefully this problem is so widespread they will have to do something about it. Same problem here. I have uninstalled and reinstalled multiple times. Shut phone down and restarted. All to no avail. Someone better fix this, I have have a lot of time invested in this game. I go to the game but it says, â€œGood News! An update for this game is waiting!â€ Then under it, it says, â€œupdateâ€ so I tap on, â€œupdateâ€ and it brings me to the App Store. Then it says, â€œopenâ€ next to the crazy barbarian with drool in coming out of itâ€™s mouth. So I tap on, â€œopenâ€ and then it brings me into coc. When I get to the loading screen though, it says, â€œGood News! An update for this game is waiting!â€ With the update button below it. I pressed th button and it brings me back to the App Store, with the, â€œopenâ€ button next to the barbarian picture. I pressed the, â€œopenâ€ button and just guess what happened. It said, â€œGood News! An update for this game is waiting!â€ I almost RIPPED my hair out. I donâ€™t want to delete the game, knowing that I will lose ALL my stuff, and pressing the stupid â€œupdateâ€ button sure isnâ€™t working either. Flip. This. Game. After updating my game this morning it kept telling me to check my network connection. It showed I was connected to the wifi but nothing worked.. So I uninstalled the game *forgot* the wifi then re entered it and everything worked re downloaded the game and everything quit working again. I have done this over and over about 6 times now… Something with the new updates is causing the phone to not stay connected to wifi.. It really doesnt make any sense to me but thats what my problem is. I have decided, to stop this game. Concentrate on studies. So many students wasting 2 or 3 years valuble time to this game like me.. today I s can 300 money for updating coc. Update not connecting uninstall. And install so many times. Iam frustrated. Iam edicted to coc. Im reliase to stop this game. Concentrate on studies. And u also stop this game. Clash of clans keep stopping message coming and not atall opening….supercell fix it. I’m having the same problem, this is just ridiculous! Me too. How can this be fixed? The biggest update in clash history and we can’t even play it. I updated, would not load, Close the app. Now when I try and open CoC, it says restart app. I keep getting the same message over and over again. Solved it. Delete it from your device and reinstall. BUT make sure it has been saved to Game Centre (or whatever the Android equivalent is) so that you donâ€™t lose everything! Me too. I have updated it but when I go to open it it keeps prompting me to update! Was able to download the update but the game won’t open. I get a connection error, telling me to check my internet connection. Everything connection error with wifi or anything else. I m not playing coc from 2 days. But when I installed it the content was not downloading. The screen always show downloading content and it is failing. Help!!!!! You have to uninstall Facebook. I know it sounds stupid, but just try it. What’s happening to the COC game. After updating the game, it appears an error of opening the game and it’s show Black screen, Sometimes it’s open sometimes none. It is hard to open it.. I already uninstall and re-install it but it’s still the same. Can they fixed this Bugs and Errors. Hopefully Sooner or later? Can’t load COC just a black screen, and today boom beach updated now it has a black screen and won’t open. I have a Galaxy S 6 and all other games play fine, but haven’t been on COC for 4 days now what the hell is going on? I can’t open the game anymore. It says connection error and I uninstalled the game and installed it again and when I opened its the same connection error thing.Whats wrong with clash of clans server I cant even open the game anymore. Please help. After updating, its start page shows downloading content but that is not happening. The incomplete bar of download content remains incomplete. What to do?? I tried – another wifi then uninstall that app & re-install but still game is not opening. On my iPhone 7 COC says it is updated and does not show that it needs to update, but when I try to play itâ€™s in need of an update. I donâ€™t know if I should just restart my phone or reinstall the app from the App Store. How the heck do you refresh by downswiping? Did the drag down and nothing happens. And suggestions for my iOS? This is frustrating. Just go to updates and pull down to refresh. the update will show!!!!!! How do you refresh on an iPhone? They must have just patched it. I refreshed the update and it went through. I’m back in my account. How do you drag down? update. Same thing happened 5 months ago. Refresh App Update. It will show up. What’s the solution on this new update, on my Ipad. Obviously I’m not the only one. Samsung 7, updated in Playstore but when trying to connect, it is still saying “connection Error”??? Tempted to uninstall game but worried about losing my base altogether??? No update in the App Store just Open. Wtf are they doing again ffs ????? Iâ€™m a co and need to be on !! Go to the app update and refresh. Boom and update. GO TO THE APP STORE AND REFRESH THE UPDATES PAGE BY SWIPING DOWN. Thanks mate even it worked for me . what a joke. . . UPDATE . . COC won’t load. .Connection Lost. .
“Try Again” . . circle. .circle. .circle. .
My Kindle updated but not iPhone 8, just says open? IF THE UPDATE IS STUCK FOR ANYONE, JUST GO TO THE APP STORE AND REFRESH THE UPDATES PAGE BY SWIPING DOWN. Figured it out. Make sure you update your iPad with the latest iOS update then you will be able to update app on iPad. Updated on iPhone X update completed but game wonâ€™t open tried deleting but now canâ€™t make a clean install. Update worked great on Samsung tablet. Suggestions? This is on my iPad. The update just goes back and forth between the update page and the open page. My game only says open and not update. Tried everything. I go to update and the App Store only says open not update. Iâ€™m stuck! This it is about the they sorted out matchmaking in Legend League. Over on Twitter they have tweeted that Clash of Clans will be down for a server maintenance.. I want to transfer my coc to my iPhone from my old iPad but every time I try to open coc it asks my to update it which I have done multiple times but every time it tells me that my iOS is to old so it updates to the latest update it can and I open it and then it asks my again to update so I can never just get into my game a transfer it help please! The new clan game feature is not working for my COC account. When I try yo start a new challenge nothing happens. I have completed 2540 coins in it.please someone help. I have also tried uninstall then install again. Still nothing is working. I went to the App Store app. Clicked the â€œupdatesâ€ icon at the bottom of the screen. Refreshed the screen by sliding finger from top of screen to bottom. After refresh it showed the â€œupdateâ€ button. I just got it too… Ipad air, go to app store, select “updates” from the bottom then I put four fingers on the screen and pulled down, it refreshed and there it was..”UPDATE” COC yes! worked for me as well. Thanks Amanda Huggenkis! Itâ€™s not working for me either on my iPad Air. It goes to a sleep page, push the round button and it comes back to the same open COC, goes back to update. Found the trick that helped me. Follow the steps to refresh. After the refresh go back to the App Store page and keep pulling from top to bottom. Make sure to stay on the app page and it will come up. I had to pull from top to bottom 3 times on the app page to get it to come up. Hope this helps. Worked on my iPhone and iPad. YES!!! Worked on Iphone 7. Thanks so much!! Back to clashing!! Now it worked, see the explanation of Amanda Huggenkis below, thx!